I'm super excited to share with you some awesomeness today. when searching for some fun ideas for crafting in the kitchen. I fell in love with their assortment of cookie and chocolate molds. I can't say enough how head-over-heels I am with the high level of quality put into producing these products. They are awesome to work with. 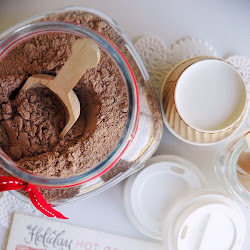 Tap the chocolate-filled mold on your work surface to remove air bubbles and to help the chocolate settle. 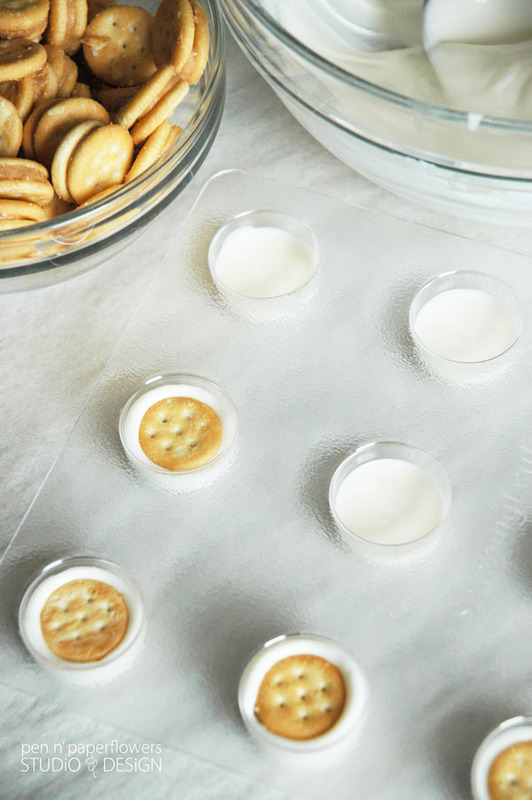 Add one mini ritz cracker to each cavity and press gently until the chocolate begins to peek over the top of the crackers. Don't push too hard - you don't want the cracker visible from the top on the finished treat. 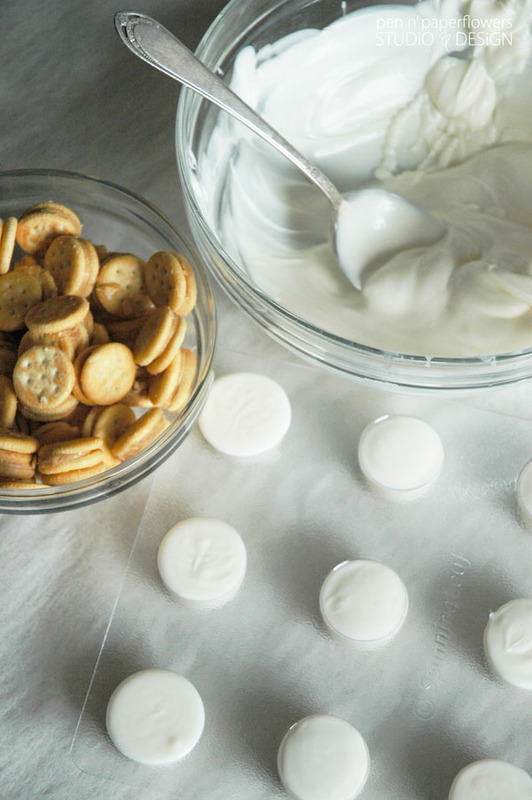 Cover the ritz crackers with additional melted chocolate. Tap lightly to remove air bubbles and for a smooth finish. Allow chocolate to harden in the mold. Refrigerate hardened chocolates in the molds for a little under 10 minutes. Turn the molds upside-down and press gently for the chocolates to pop out. 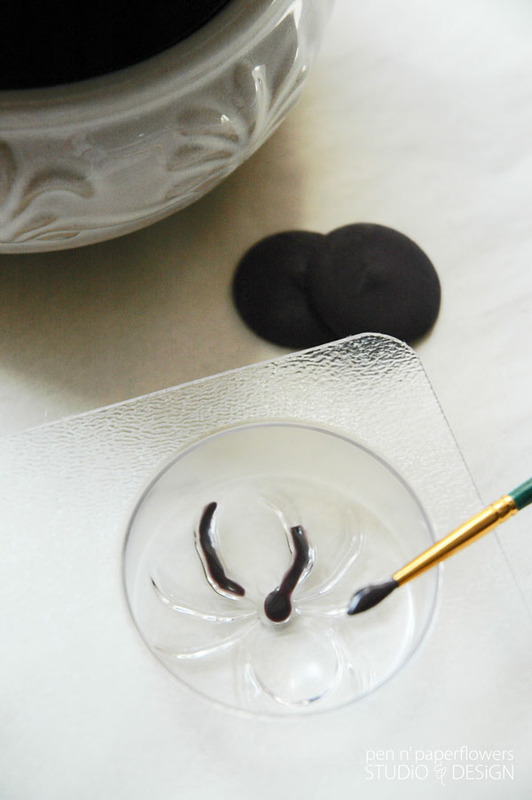 Start by filling the eye and mouth cavities of the cookie mold with black melted chocolate. Using a small paint brush for these chocolate details works perfectly. Tap molds on work surface to smooth chocolate. 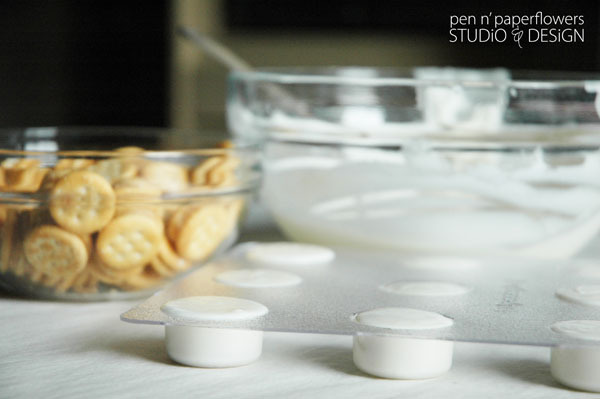 fill the cavities 1/3 full with COOLED melted white chocolate. Add one Double Stuff Oreo Cookie to each cavity. Press gently until the chocolate begins to peek over the top of the cookies. 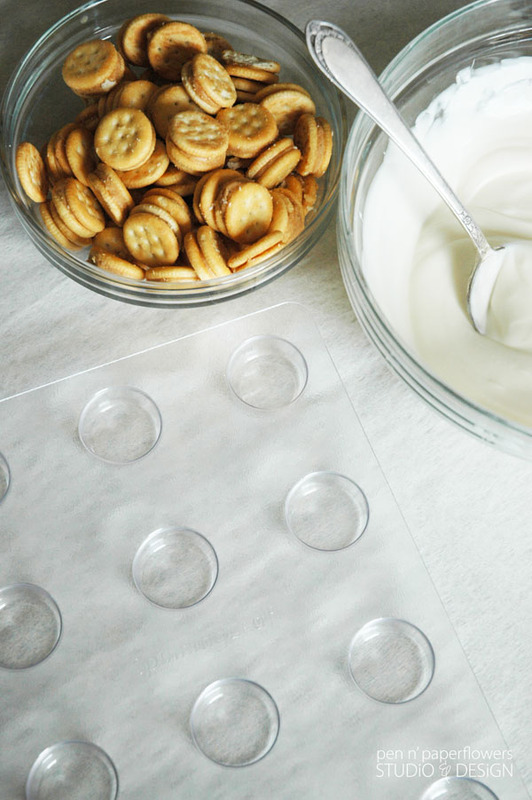 Don't push too hard - you don't want the cookies visible from the top on the finished treat. 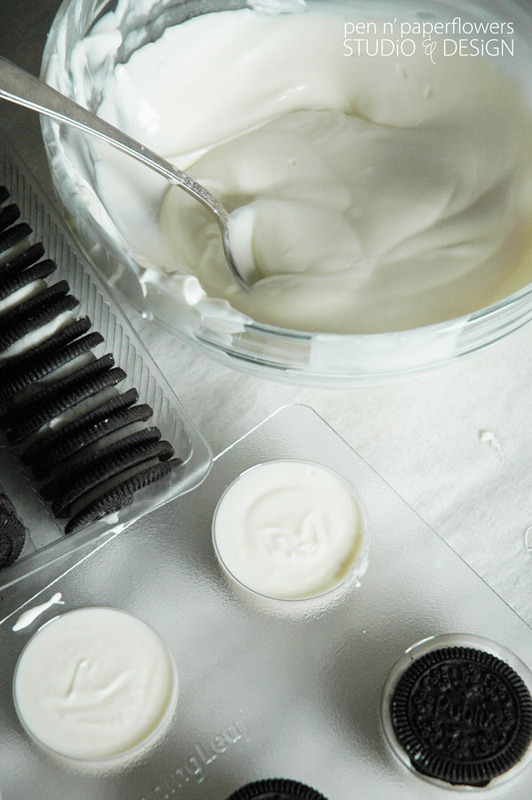 Cover the Oreo Cookies with additional melted chocolate. 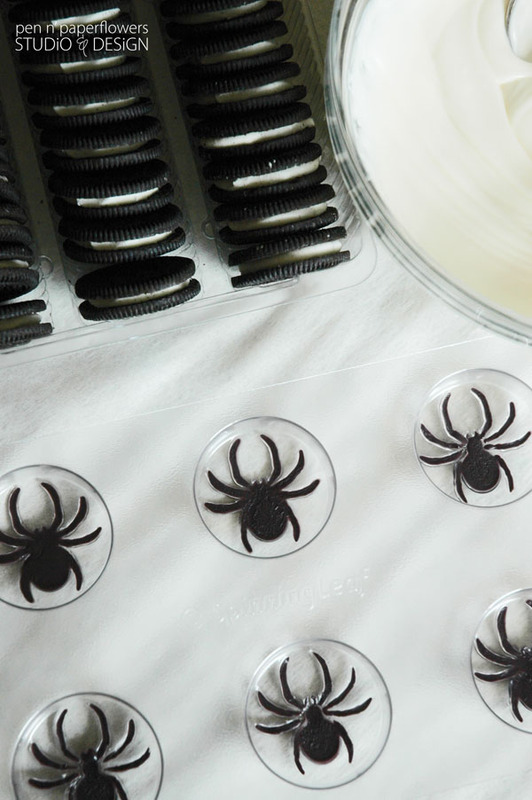 Start by filling the spider details of the cavities of the cookie mold with black melted chocolate. Using an extra tiny paint brush for these chocolate details works perfectly. Tap molds on work surface to smooth chocolate. Although only ONE spider turned out "perfect"
I actually like the aged/textured look of the "imperfect" spiders. 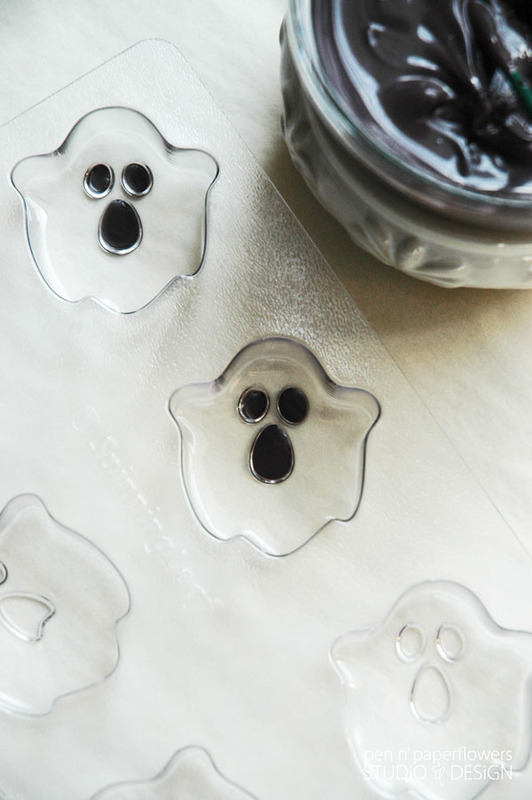 Are you itching to get your hands on some of these incredibly fun cookie molds? with high quality products and service. You know I LOVE that!! Spinning Leaf has decided to offer an incredible savings to all Pen N' Paperflowers readers/fans. They are offering a 30% discount for anything on their site. the biggest discount they offer. EVER. (and typically only twice a year). to THREE different winners here on Pen N' Paperflowers. 6 molds for 3 different winners. Use the Rafflecopter app below to enter. 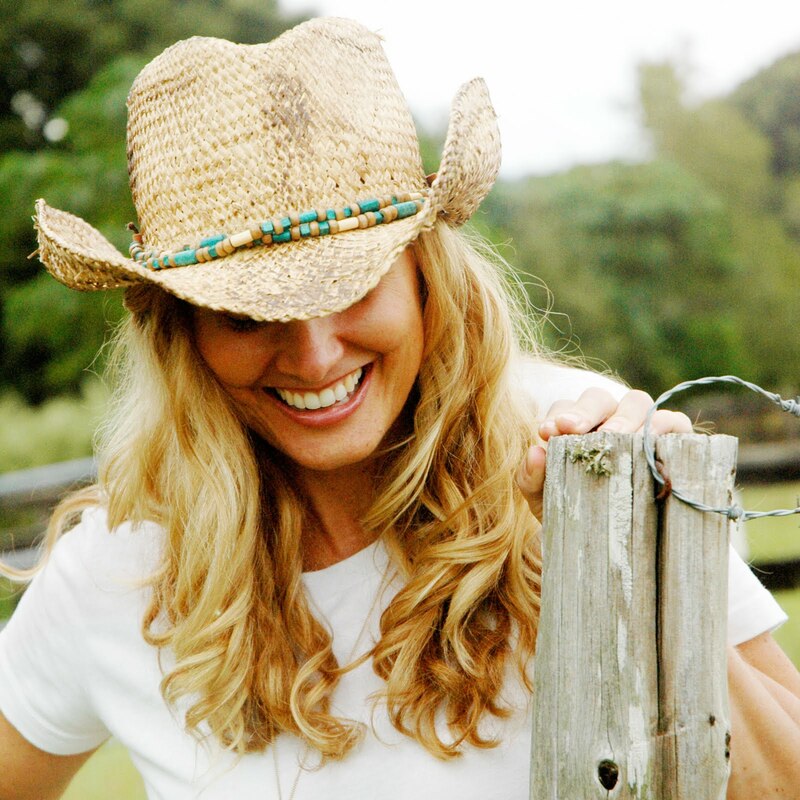 Be sure to check out and "Like" Spinning Leaf's Facebook Fan Page. I do NOT recommend the spider mold if you are a novice. It was SUPER hard and time-consuming. 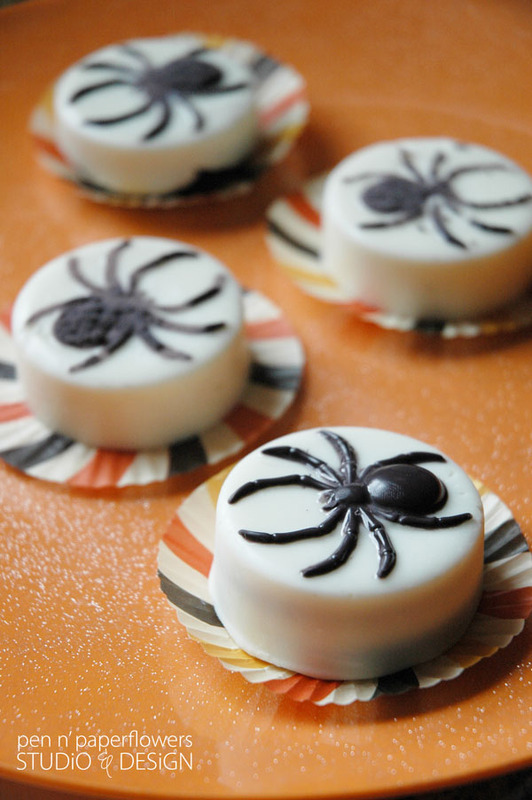 It took me 15 minutes per spider cavity - just to paint the chocolate spider details. It takes tremendous patience and focus. prior to shipping the molds out. They need a fairy wand. I LOVE the mini Ritz cracker treats!!! 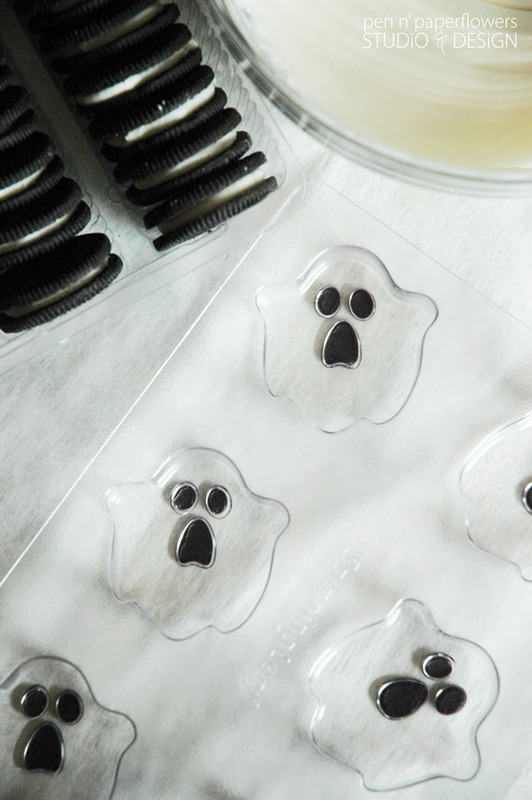 Wow, I love the cookie molds. The Christmas themed molds are AWESOME!!! 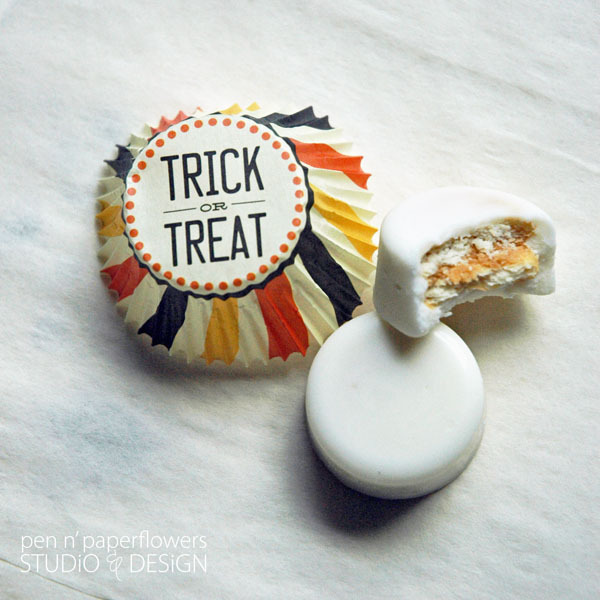 I love the Halloween molds--especially the candy corn cookie mold. I also love the bride and groom molds. 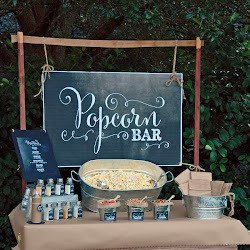 I would love to see some Egyptian themed molds-- maybe a pyramid, ahnk, egyptian eye design, etc... for an upcoming party theme I am working on. So glad to have found you! My son's birthday is next month (10/30) & I bet he would LOVE to give the skull cookies to all of his friends!! I am loving everything. 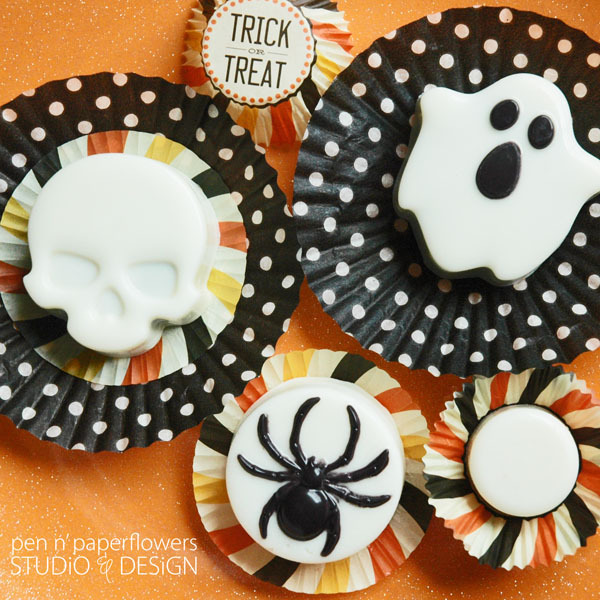 How neat to spice up a cookie! I absolutely love the bride & groom, candy corn, happy birthday, football, christmas tree, peppermint candy, turkey, winter snowflakes, spooky pumpkins, and many more! Thank you for an awesome giveaway! Good luck to everyone who has entered! 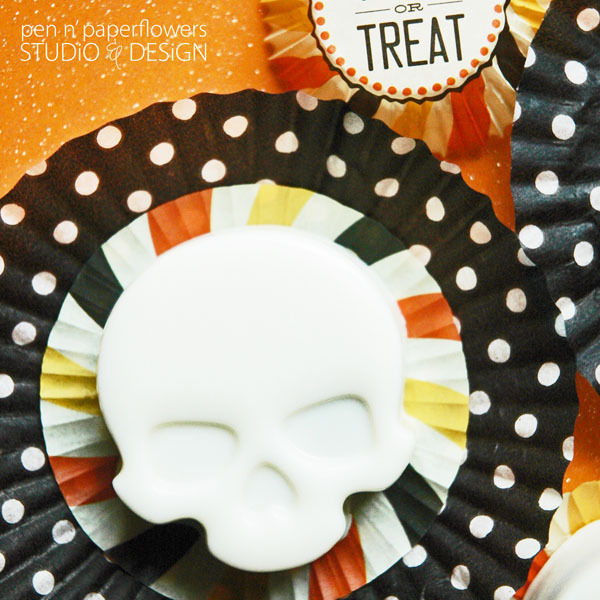 I love the heart mold, all the halloween molds (bat, spider, and my fav: candy corn), and the snowflakes! I wish they had non-scary pumpkins. The jack-0-lanterns are cute but not so much for my kindergartner's classroom. 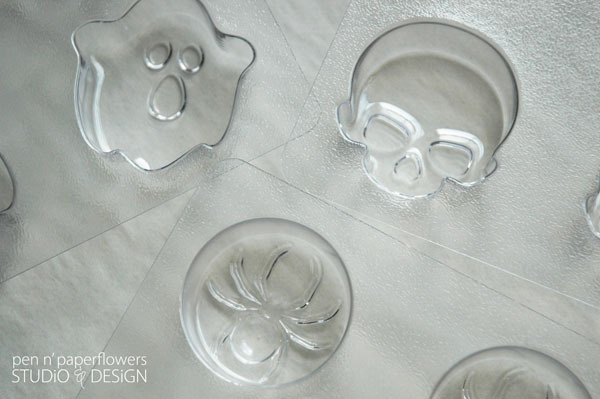 I love the ghost and large round mold! 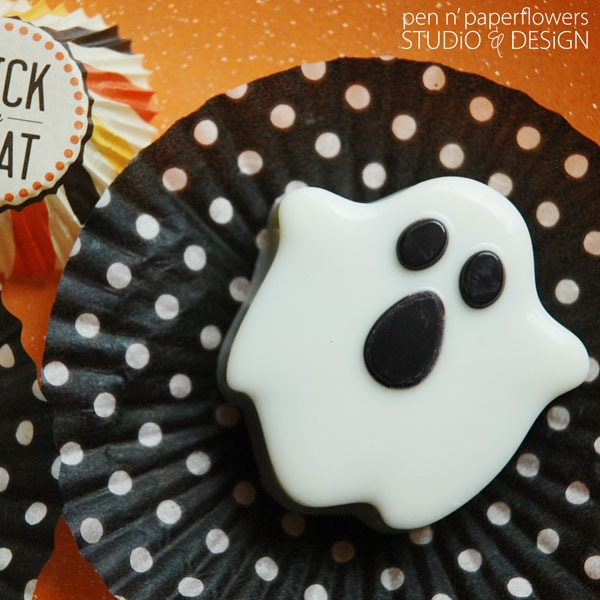 So cute for school Halloween parties! I think these are absolutely amazing, and have wondered for so long how to get such perfectly shaped chocolate on the cookies. Had a DUH moment as I read through the post. i love Spinning leaf molds! I have the christmas ones and love them! My daughters would love these! All of the designs are spectacular! 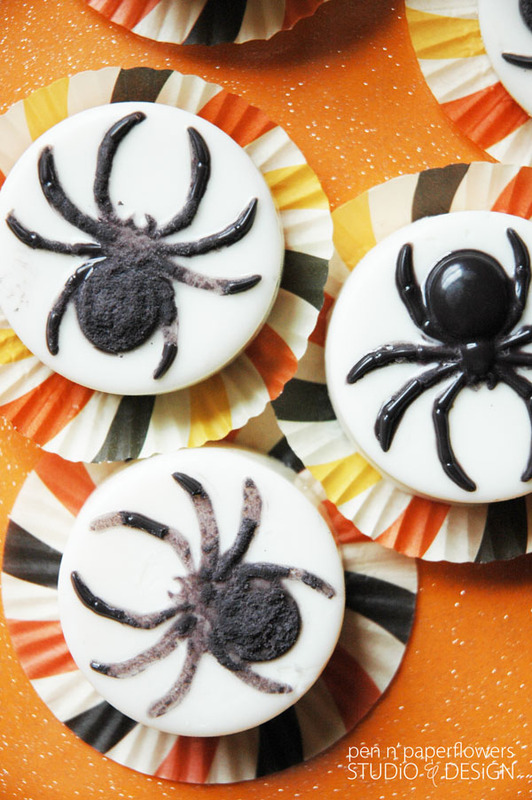 Love all the Halloween cookie molds!! Would love to see a carousel style cookie mold. totally would do the winter snowflakes for snow in Arizona!!!! Thank you Pen N' Paperflowers for sharing your talent with us. I agree with you that the molds of Spinning Leaf are awesome. My favorite mold would be the Teacher Appreciation Sandwich Cookie Mold. I am a Kindergarten Teacher and would love to give darling cookies to my fellow Teachers as a thank you gift. I give the Teacher Appreciation Sandwich Cookie Mold an A+. Thank you for the giveaway. 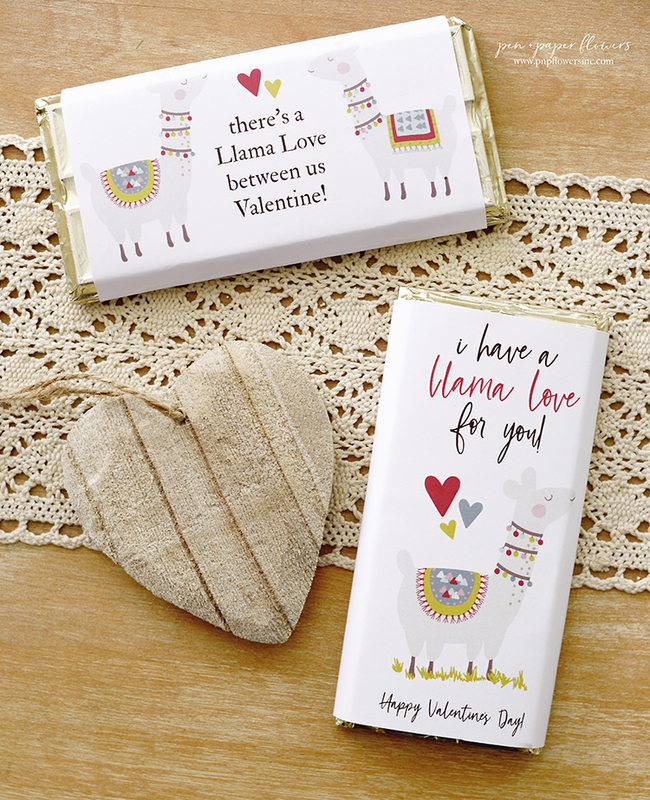 Where do I start.....the peppermint candy mold, the snowflake, the L-O-V-E letters, the conversation hearts...they are all so cute! Thanks for the chance to win! Any of the sports-themed cookie molds are great! Any castle/kinights theme molds would be great to see. The snowman mold will be perfect for my daughter's class holiday party! These are adorable! I hope they are as easy as you made them look!! I love the daisy and the flipflop! Would love to try these with my 11 year old daughter. I can't think of a mold that they haven't covered even though I'm sure there are some! Would love to try any of them!